A fireplace or wood burning stove "can on occasion send smoke back into the room" there are many reasons for this phenomenon; we will mention a few of the more common reasons below. Continual downdrafting or smoking back can mean a plugged or blocked chimney and requires an inspection by a qualified chimney sweep to ensure good draft is restored and the "dangers of carbon monoxide contamination" is avoided; see our information on unwelcome visitors in your chimney. Sometimes we forget why our forefathers changed to central heating systems. Wood burning appliances require regular maintenance to be safe and reliable. Any obstacle that affects airflow over and around the top of the chimney can negatively effect it's performance. This can include trees, buildings, or adjacent roof-lines which are common obstacles to airflow. 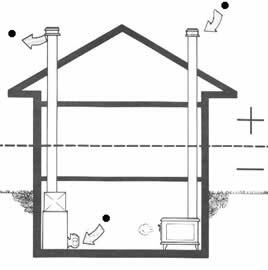 If it appears that nearby obstacles may be having an affect on chimney draft, an extra metre or more of chimney height may be one of the answers to help to prevent downdrafts. Chimney cap design or blockage can affect the amount of draft produced by air flowing over the chimney. Some specialized chimney caps can sometimes help to prevent downdraft due to airflow turbulence or air flowing down towards the top of the chimney. Always consult the manufacturer of the chimney or a qualified chimney sweep; do not try and second guest what the problem might be. Just as draft is created in chimneys by the buoyancy of the hot gases, a form of draft is created in houses because of the difference in temperature between the air inside the house and the outside air. The warm air inside the house tends to rise because it is less dense and lighter than the outside air. The tendency of the warm house air to rise results in pressure differences at various levels in the house. The pressure in the basement and lower levels of the house will be less than the atmospheric pressure. This effect is similar to the low pressure at the base of a chimney. In upper levels of the house the pressure will be higher than the atmospheric pressure as the rising air pushes against the ceiling. At some point between the high and low pressure zones, the pressure will he neutral. This point is called the neutral pressure plane. These variations in pressure is called the stack effect. The taller the house is, the greater the stack effect.The stack effect in your house can make a considerable difference in the venting performance of a wood burning appliance. Basement wood burning appliance installations are the most susceptible to problems caused by the stack effect since they are located at the lowest point in the building. 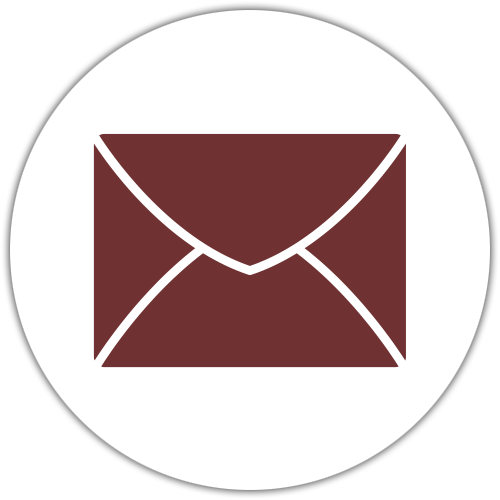 Wood burning appliances installed in basements commonly operate in this negative pressure environment and are the most susceptible to backdrafting problems. In general, appliances and chimney openings located below the neutral pressure plane of the house must work against the negative pressure induced by the stack effect. Conversely, appliances and chimney openings located above the neutral pressure plane are assisted by the positive pressure induced by the stack effect. The neutral pressure plane tends to move towards the leakiest level of the house. This movement of the neutral pressure plane explains why opening a basement window can improve chimney flow in a basement installation. The open basement window represents a large enough leak to bring the neutral pressure plane down to basement level, reducing or eliminating the negative pressure the chimney has to work against. If you experience occasional downdrafting opening a door or window for a few minutes to change the neutral pressure plane will help prevent that unpleasant smoke filled room. The first two suggestions are simple ways to test if you have negative air pressure before lighting your fire and the third is the solution to eliminating the problem. Hold your hand inside the fire box and up near the damper (make sure the damper is open) and see if you feel cold air coming down the chimney. Light a good size sheet of paper and hold it in that same position up near the damper; if the fire goes out or the flames are being blown back the stack effect is happening. So now you should understand and be able to eliminate the stack effect in your house. Remember the warm air in a house tends to rise, producing a stack effect similar to the draft in chimneys. The resulting negative pressure in a basement can cause venting problems in appliances located there so always do one of the two tests before lighting your fire and you will be able to eliminate any unpleasent smoke effects in the room! 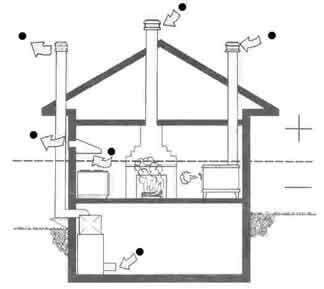 A chimney installed on the outside wall of a house and serving a basement installation is most susceptible to backdrafting caused by the stack effect. At standby (no fire in the appliance), the air in the flue can cool to outside temperature. With no temperature difference, no draft is produced in the chimney, and the minor negative pressure acting on the air inlets of the appliance can readily cause reverse flow in the chimney. Backdrafting at standby is clear evidence of the stack effect in buildings. Such backdrafting may also be caused by other exhaust ventilators creating negative pressure, but this possible source is easily checked by carrying out a ventilation inventory. It is sometimes suggested that reverse flow in a chimney can be cured by holding a burning piece of paper or a hair drier at the base of the chimney to heat the flue. But heating the flue only treats the symptoms of the problem, not the problem itself. Remember, a chimney that backdrafts at standby can also backdraft during a receding fire, especially in cold weather when an exterior chimney is being severely chilled. Backdrafting during a receding fire spills poisonous carbon monoxide into the house. The stack effect in houses is a natural phenomenon but you can reduce or eliminate the effects that it has on the venting of a woodburning appliance. The surest way to overcome the stack effect is to provide a directly ducted source of outside air to the combustion air inlet of the appliance. This isolates the combustion and venting systems from the rest of the house. When an appliance installed in a basement has a fitting to accept an outdoor air duct,"always" connect the duct to prevent possible backdrafting. Indirect sources of outside air are possible but not usually desirable. A hole in the basement wall may serve as an entry combustion air, but the air flowing through the hole would mainly compensate for air leaking out the upper parts of the house. Only a small proportion of the incoming air would be used for combustion in the appliance The effect of creating the opening is similar to that of opening a basement window - it lowers the neutral pressure plane and therefore reduces the negative pressure in the basement. Another way to overcome stack effect is to open a window in the room using the outside air help equalize the pressure problem and provide makeup air for the fire to use. The effect would be to improve the quantity of available air the basement, or at least reduce the amount of negative pressure there. This solution is available only when a window or source of air is in the same room. When diagnosing a draft-related problem in a basement installation, always keep in mind that negative pressure induced by stack effect is a contributing factor. Energy conservation measures are making houses more and more airtight. Sealed vapour barriers, caulking, and carefully installed and weather-stripped doors and windows all reduce the leakage of air into and out of houses (infiltration and exfiltration, respectively). The shell, or envelope, of such houses resists airflows created by exhaust ventilators. Fuel-burning appliances are exhaust ventilators, as are kitchen and bathroom fans, clothes dryers, and central vacuum systems. All draw air from the house and exhaust it outside.When an exhaust ventilator such as a kitchen fan or clothes dryer operates in a well-sealed house, it may not get all the air it needs to function properly. All draw air from the house and exhaust it outside. When an exhaust ventilator operates in a well-sealed house, it may not get all the air it needs to function properly. When two or more exhaust ventilators operate at once, they may compete with each other for available air. In a competition for air, mechanical systems usually win out over natural draft systems causing the natural draft appliance to become starved for air. The operation of a clothes dryer or high-volume kitchen exhaust can cause backdrafting of a fireplace or other woodburning system. In theory, all exhaust ventilators should be supplied with ducted sources of outdoor air. However, the many complications involved make the complete isolation of all ventilators very rare. Exhaust ventilators operating on natural draft cannot usually compete with mechanically-powered ventilators. The chimney serving a wood stove may backdraft when the negative pressure produced by mechanical ventilators overcomes chimney draft. A directly-ducted supply of outdoor combustion air can assist the woodburning appliance and chimney with added air to help prevent the negative pressure that can be caused by the natural stack effect or the effect of mechanical ventilators. 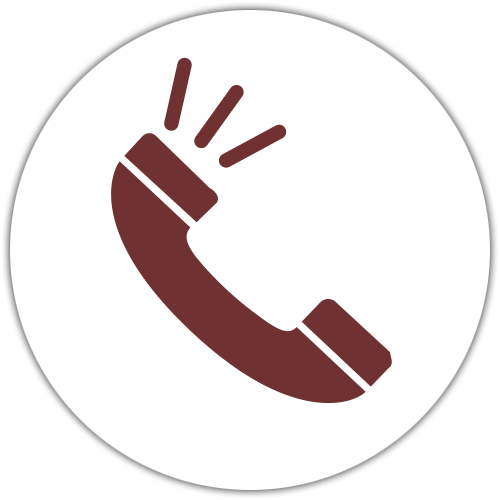 To assist in reliable operation some woodburning appliances installed in well-sealed houses can be provided with a directly-ducted source of outside combustion air. The connection of an air duct to a conventional woodburning appliance can be difficult, depending on the design of the combustion air control. Appliances certified for use in mobile homes must be provided with duct connections to their combustion air inlets. They also tend to have a relatively low heat output, which can be suitable for well sealed houses. Fireplaces present a particular problem because they consume so much room air, especially open fireplaces or when the doors are open. Even with doors closed, most fireplaces need large amounts of room air. For this reason it is best to provide a fireplace with close-fitting glass doors and some fireplaces can have a directly ducted source of outdoor air for combustion. Some appliances, notably cook stoves, have multiple air inlets to which ducts cannot be connected. If you cannot attach a ducted source of outside air to an appliance, you must compensate for the room air it consumes. One solution is to equalize the pressure in the house is by bringing outside air in and distributing it through a forced air distribution system. It is possible, however, to bring in only enough outdoor air to compensate for air removed by continuously-operating ventilators such as woodstoves. The simple natural solution may be easier than you think, visit our Pure Air Plus Division and see how a passive residential ventilation system can provide makeup air that brings in only the required outside air warms it and distributes it through your forced air system. To see why you should also be concerned about clean air in your home use this link Indoor air quality.